President Of Omega Raynald Aeschlimann and Alessandra Ambrosio attend Gold Night at OMEGA House Rio 2016 . Alessandra Ambrosio wowed in white as she attended an Olympics party hosted by luxury watchmaker Omega in Rio de Janeiro. The 35-year-old supermodel made a showstopping appearance in a white lace-up pencil skirt. 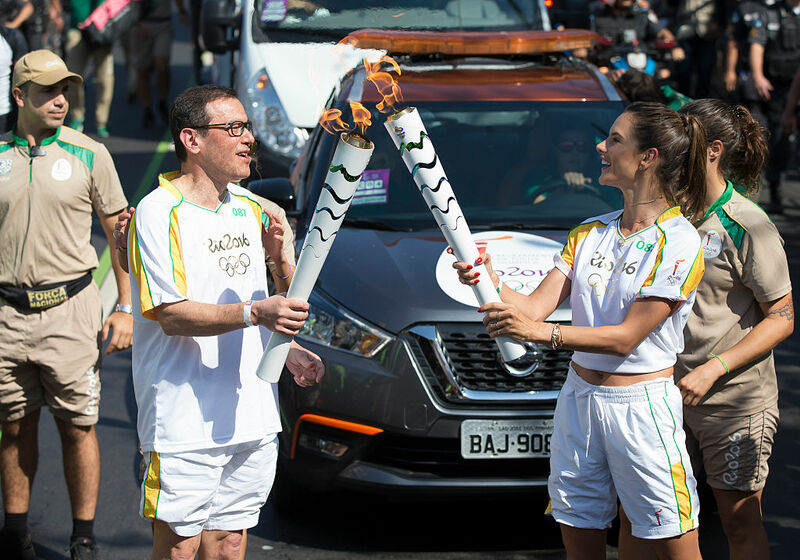 Coca-Cola Torch Bearer Alessandra Ambrosio (R) has the ultimate #ThatsGold moment as she runs with the Olympic flame through Rio de Janeiro.